The Guitar comes with an approximately three hour comprehensive and interactive "Learn to Play Guitar DVD". The Guitar Lessons are taught by a Veteran Guitar Teacher and explained thoroughly. This "Guitar" is 38 inches in length and come with Steel Strings. The guitar has Linden Binding and wood construction with geared tuning. Each of these "Guitars" comes with an extra set of steel strings, pick, tuner, gig bag and strap. The Steel String Acoustic Guitar is perhaps the most versatile and common guitar type. The "Guitars" have a loud, bright ringing tone that clearly projects to the listener. This type of "Guitar" is the backbone of most country and bluegrass bands. It's perfect for backing a singer and its stylistic palette encompasses everything from New Age and Country Blues, to hot Bluegrass flat picking, jazz fusion and "unplugged" rock. Tuning Pegs are made of Brass and Steel for easy tuning and to keep the tuned string held in position. Everything you need in a Starters Guitar to start jamming out at an amazing low price! If you need Beginner Guitars for A Starter Adult or for a Kid to learn how to play acoustic guitar get yourself this Guitar and start jamming like a pro in no time. 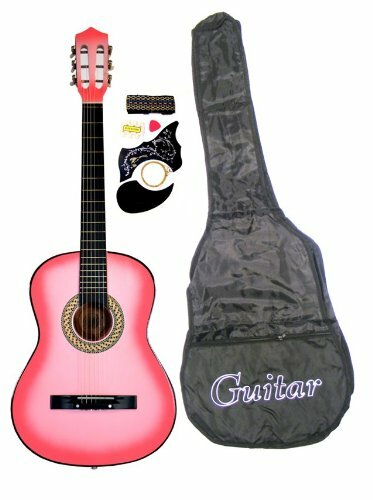 This 38 inch "Guitar" with starter pack is perfect for all beginners! Comes in Several Colors: Blue, Purple, Black, Pink, Red, Coffee, Green, Sunburst, White, Natural, Classical, Brown. Please note: Acoustic guitars come standard with only one strap pin – at the heel of the lower bout. Although a second strap pin can be easily installed by any qualified guitar technician, it is not necessary in order to use a guitar strap. You could tie it around the neck, above the nut, at the head-stock. There are many helpful instructions on the web as well. - Guitar includes a three hour Comprehensive and interactive "Learn to Play Guitar DVD"
If you have any questions about this product by Fret, contact us by completing and submitting the form below. If you are looking for a specif part number, please include it with your message.